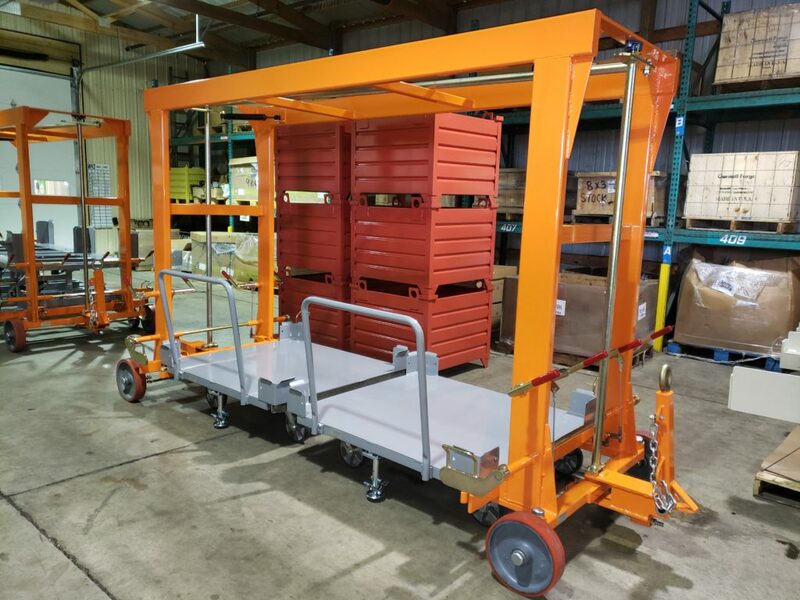 STURTEVANT, Wisconsin – Topper Industrial (www.topperindustrial.com) exhibiting at ProMat 2019 in Chicago at booth S4812 specializes in the engineering, design and manufacturing of Industrial Delivery Carts and Cart Systems. As a leader in the industry, Topper will have various custom-built delivery cart types on display in booth for demonstration and discussion. Topper Industrial is very proud of their Walk Through, Wheels on the Ground Mother / Daughter Cart System. It is patented under US Patent No. 10,093,334. It will be showcased at ProMat 2019 with various daughter cart applications. A Mother Daughter Cart is an industrial cart system consisting of one large mother cart and two or more, smaller daughter carts. The daughter carts are designed to fit within the mother cart’s frame work. Once inside, the daughter carts are locked into the mother cart. The mother cart and daughter carts are then able to be tugged as one. Daughter Carts can be and are often different types of delivery carts. For instance, One Mother Cart can be designed to carry different types and different sizes of daughter carts in the same framework. Topper Industrial (www.topperindustrial.com) is a leading manufacturer of all material handling equipment needed lineside. Topper’s capabilities also include, but are not limited to Industrial Containers, Pallets, Lift/Tilt Systems, Racking and Tube & Joint. To learn more information on Topper Industrial Cart Delivery Solutions, email sales@topperindustrial.com. Topper Industrial will be at ProMat in Chicago Booth #S4812 from April 8 – 11, 2019. Register to attend HERE. For more than twenty years, Topper Industrial, (www.topperindustrial.com) has been a leading manufacturer of material handling carts and equipment solutions. Topper Industrial designs and builds industrial delivery carts, cart lifts, lifts & tilts, material handling racks, steel containers, casters, tube & joint and industrial cart parts & components. Topper Industrial specializes in services to Manufacturing, Fulfillment, Warehousing and the Distribution Sectors. Topper Industrial’s services include, but are not limited to: Design & customization, manufacturing & production, site analysis & planning and implementation justification. Topper’s material handling solutions make delivering material line side more effective through more efficient practices. Innovations in Cart Delivery: Quad Steer Cart with Rotate Top.